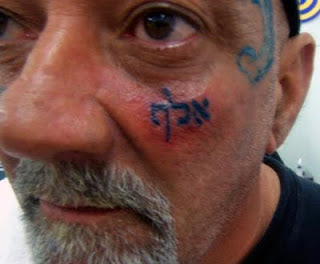 This guy thinks his Hebrew tattoo means "Unity of God", which it doesn't. Not in any direct way at least. 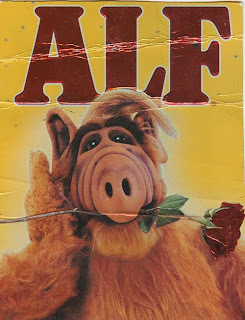 Yep, that's Alf, my childhood hero. The die-hard Alf fans would kill to get this Hebrew tattoo on their faces! 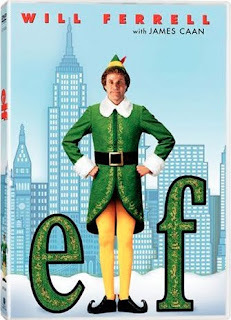 It could also be Alef, the alphabet letter (why would anyone want that?) or Elef - which means thousand, to show exactly how one picture can be worth a thousand words! Love your titles and humor. I'd have called this one "What's it all about, (Alfie)?" from the (once?) popular song. But just possibly he went to a weird school where the class name ('kita aleph') is tattooed, just to keep track of the little munchkins. Like we say 'Gehe vays.' Update: he's from Florida, and damned proud of it, is all.. I seared your site and I couldn't find any traslation you had done for the word sanctification. I want to get this done but done right, so could you please translate it for me? Or better yet, be in email contact, especially if your design has more than just that one word.. Typo will do his stellar best to make sure you don't end up on these pages, ha. The letter א should be spelled as אל"ף. As you say yourself, 'aleph' does not mean 'unity of God' in a direct sense. However, in Jewish mysticism, 'aleph' refers to the 'one-ness' of God's realm, as opposed to the 'two-ness' that characterizes our physical world (good vs. bad; male vs. female, etc.). So in a mystical sense, 'aleph' could very well be said to stand for 'unity of God'. Just the letter aleph would have been sufficient to convey that meaning, though.